Golden State Warriors guard Klay Thompson has been named to the NBA Western Conference All-Star team, the league announced today. Thompson, a first-time All-Star, joins backcourt mate and All-Star starter Stephen Curry on the Western Conference squad, giving the Warriors two All-Star selections for the first time since Tim Hardaway and Chris Mullin both earned the nod in 1993 (Mullin did not play due to injury). Thompson’s selection marks the first time in franchise history that the Warriors have had two guards in the All-Star Game. Warriors Head Coach Steve Kerr and his staff will coach the Western Conference All-Star team by virtue of the Warriors clinching the best record in the West through games played Feb. 1. Thompson, 24, is averaging career highs of 23.0 points (seventh in the NBA), 3.0 assists, 1.29 steals and 0.93 blocks to go with 3.6 rebounds and 32.6 minutes in 42 games, hitting career marks of 48.1 percent from the field and 45.6 percent from three-point range (third) for the NBA-leading Warriors (36-7). Thompson has won the Western Conference Player of the Week Award three times this season, becoming the first player in franchise history to win three weekly honors in a single season. The Washington State product ranks third in the league in three-point field goals (136) and has hit multiple threes in a franchise-record 22 consecutive games, tied for the third-longest such streak in NBA history. Thompson has tallied a career-best six 30-point games, three 40-point games and one 50-point game, a career-high 52 points that came in record-breaking fashion on Jan. 23 vs. Sacramento. In his 52-point performance, Thompson set an NBA mark for most points in a single quarter, tallying 37 points in the third frame on a perfect 13-of-13 from the field and 9-of-9 from three-point range. The fourth-year guard eclipsed the previous league-record for points in a quarter of 33, held by George Gervin (April 9, 1978) and Carmelo Anthony (Dec. 10, 2008), while topping Wilt Chamberlain’s franchise-mark of 31 points set in the fourth quarter of his NBA-record 100-point game on March 2, 1962. Thompson’s nine threes in the frame set a new NBA record while his 13 field goals matched David Thompson’s mark set on April 9, 1978, and his 11 three-pointers in the game matched the franchise-record that Curry set in his career-high 54-point game on Feb. 27, 2013. Take a look back at all 37 points Klay Thompson scored in the third quarter of the Warriors' win over the Kings on January 23. Thompson set an NBA record for points in a quarter, 3-pointers in a quarter (9) and tied a league record for field goals made in a quarter by going 13-for-13 from the field. Check out the top 10 plays that made Warriors guard Klay Thompson a 2015 West All-Star Reserve. A look back at every point of Klay Thompson's record-breaking 3rd quarter performance in which he shot 13-13 FGs including 9- 9 from 3-point range. Klay Thompson hits 13-of -13 shots with 9 3s to notch a NBA-record 37 points in the third quarter. Klay Thompson sets an NBA record for points in a quarter with 37 points in the 3rd quarter as the Warriors beat the Kings 126-101 at Oracle Arena on Friday night. Klay Thompson records 30 points and 10 rebounds in the tough ovetime loss to the Bulls. The Warriors get set for the visiting Chicago Bulls as Stephen Curry takes part in an All-Star photo shoot and Klay Thompson earns even more NBA honors. Thompson has helped lead the Warriors to their best start in franchise history with an NBA-best record of 36-7 through the first 43 games of the 2014-15 campaign. 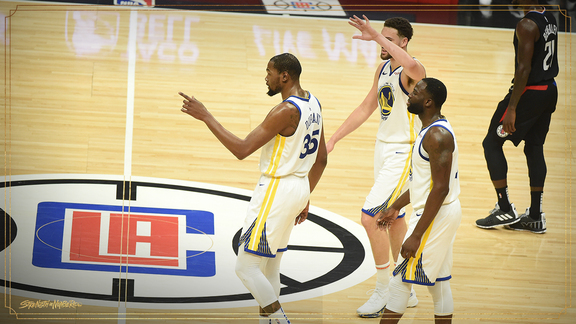 Golden State has set franchise records with an overall win streak of 16 games (Nov. 13 – Dec. 14), a home win streak of 19 (Nov. 13 – Jan. 25) and a road win streak of 10 (Nov. 16 – Dec. 14) this season. The 2015 All-Star reserves were selected by the 30 NBA head coaches, who were asked to vote for seven players in their respective conferences—three frontcourt players, two guards and two additional players regardless of position. They were not permitted to vote for players from their own team. The 64th NBA All-Star Game in New York City will be seen by fans in 215 countries and territories and will be heard in 47 languages. TNT will televise the All-Star Game for the 13th consecutive year, Turner Sports' 30th year of NBA All-Star coverage. Warriors 2015 All-Star merchandise is available for purchase at warriorsteamstore.com.